Definition at line 136 of file AMDGPUDisassembler.h. Definition at line 141 of file AMDGPUDisassembler.h. References llvm::Address, llvm::MCDisassembler::tryAddingPcLoadReferenceComment(), and llvm::MCDisassembler::tryAddingSymbolicOperand(). For instance, in Mach-O, this is used to add annotations to instructions that use C string literals, as found in __cstring. Definition at line 935 of file AMDGPUDisassembler.cpp. Instead of having a difficult to read immediate, a symbolic operand would represent this immediate in a more understandable way, for instance as a symbol or an offset from a symbol. Relocations can also be used to enrich the symbolic expression. Inst - The MCInst where to insert the symbolic operand. cStream - Stream to print comments and annotations on. Value - Operand value, pc-adjusted by the caller if necessary. Address - Load address of the instruction. IsBranch - Is the instruction a branch? Offset - Byte offset of the operand inside the inst. InstSize - Size of the instruction in bytes. 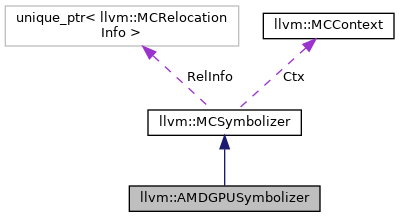 Whether a symbolic operand was added. Definition at line 906 of file AMDGPUDisassembler.cpp. References llvm::MCID::Add, llvm::MCInst::addOperand(), llvm::MCSymbolRefExpr::create(), llvm::MCOperand::createExpr(), llvm::find_if(), and llvm::ELF::STT_NOTYPE.